Can overpower, recommend 5-10% range for wearable fragrances. 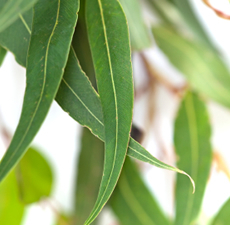 Eucalyptus Globulus Essential Oil has a very herbaceous scent with soft woody undertones. The Eucalyptus tree is a beautiful tall evergreen that can grow up to 90 meters high (270 feet). The young trees have oval bluish-green leaves while the mature trees develop long, narrow, yellowish leaves, creamy-white flowers and a smooth, pale grey bark. Eucalyptus Globulus Essential Oil has been used on all sorts of skin ailments such as burns, blisters, wounds, insect bites, lice, and skin infections. It has also been used to combat the effects of colds and flu, and there is a history of its application to sore muscles and joints.